Of course, if you know me well or if you have known me as an adult, you know that I was really joking there! I don’t have a single violent bone in me! The harassment, abuse, and profiling I experienced outside Nepal, looking back now, it was as if like the universe, again, were telling me to “Go back where you came from” as it were! Except, even where I came from, I had been a victim of prejudice and discrimination (click here, here, and here for more). As a matter of fact, one of the reasons for wanting to go abroad for studies had been to escape from all that. While the reason for that in Nepal was my ethnicity and/or caste, outside of Nepal, it was my skin color and facial features. I had already experienced some of that as a student in Italy, the US, and the UK. And as a professional, I had already experienced a little of that in Hong Kong in 1995-96 and in the UK in 2003-04. 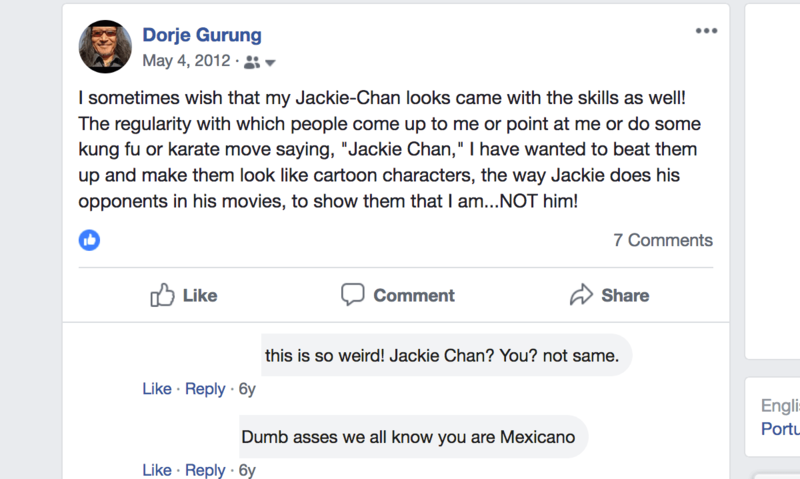 Returning to racism…the Summer of 2009, when I had for the first time set a timeline for my return home, had been preceded by two years of some of the worst racism I had experienced…until that time! At the time I had been living and working in the city of Baku in Azerbaijan, a Muslim State. I regularly endured taunts, mockery, verbal abuse, and even threats of physical assaults on the streets, in bars, and clubs from the locals as well as from some expats working in the oil industry. As a matter of fact, Baku was the one and only city where, for the first and last time, as an adult, I got assaulted by a local man leading to a fist fight between the two of us on the streets! I was also blatantly profiled, such as by restaurant staff. When alone and not with my Caucasian friends or colleagues, they would refuse me seating saying, “All the tables are reserved.” To be sure, the reason was not that I didn’t spend money when I was alone! Being constantly on the alert and lookout, and constantly rankled, living in the city was stressful and exhausting. The toxic work environment at the school and the frequent and high level of harassment outside frustrated and angered me greatly. However, I never let that affect my teaching or my relationships with my students and colleagues. I never vented my strong feelings in any anti-social manner or on anyone who had nothing to do with them. I would only vent to friends — who understood and sympathized — in the privacy of our homes. I also vented on Facebook, in the form of sometimes cryptic and other times not so cryptic status updates, starting with the following one in August 2009. Another Bakuards post, this one made on January 11, 2010. Another harsh status update about the Azeri people. Just desperate to leave the country, I started a countdown the Spring of 2010. By that time, I was nearing the end of preparation for the move to Hong Kong for my next international teaching stint. Incredibly relieved to finally be leaving the country soon, on June 24, I make my last countdown post. However, by that time, I had lost my Hong Kong job. Instead, I was heading instead to Vietnam where again I would be victimized for my looks by fellow Asians the way the Cantonese had done in Hong Kong. Issues at the school led me decide to leave after just a year there and I would next end up in Qatar, another Muslim State, like Azerbaijan. The way I was mistreated in Qatar based on my nationality, would far exceed Azerbaijan. I suffered incredibly both inside and outside the school. In school,a little different from that in Azerbaijan, the source of the suffering were the students and their parents entirely. (I have written about that in great details here, here, here, here, here, and here.) Outside though it was not much different from how it had been in Baku. I was discriminated and profiled by different establishments — notably restaurants, bars, and clubs at five-star hotels — and by others. I was driven to make the May 4, 2012, Facebook post (see image at the top) by some of those experiences both in Qatar and elsewhere, notably in Azerbaijan and in Sri Lanka. Restaurants and bars at five star hotels, for instance, would let me in without any question or issue when accompanied by my Western friends, no different from how it had been in Baku, Azerbaijan. When alone though, they would sometimes have an excuse to not let me in saying, for example, “It’s full!” However, after experiencing that enough times, I knew the drill. I would open my mouth and, speaking English in my North-American accent, point out the patrons exiting the joint. The bouncer would then let me pass. Once, when I walked up, alone, to a Mexican restaurant entrance, they wouldn’t let me pass because I didn’t have “proper shoes!” The same shoes — my running shoes — had been perfectly fine the evening before. The difference had been, of course, then I had been accompanied by a bunch of Caucasian friends! At times some places would ask for a hefty non-existent cover charge. Dealing with anyone outside of school like at the bank or at the medical center or the department of motor vehicles for my license etc. were again a pain. On a power trip, they would place hurdles and make me jump through unnecessary hoops etc. To give but just one example, when I failed my driving license oral test the first time around, I had to reschedule it for another day — for almost two weeks later — AND pay 50QR (around USD13) again! My American colleagues, I discovered later, had just been told to go back to the end of the line and wait for their turn for a re-test! They didn’t have to fork out the extra fee either! Of course, by the time I had arrived in Doha, I had learned to NOT display any strong emotional reaction to people obviously mistreating me because of how they viewed me. But no different from how it had been in Baku, Azerbaijan, anger and exasperation did drive me to make the following post on Facebook, about a month before I had the job offer for Fall 2013. Correction: “one” should have been “on” of course. The racism I encountered, of course, complicated and compounded my depression. They also contributed to my feeling of weariness with moving and traveling. I didn’t travel to any neighboring country even though I had had Petra in Jordan and the Pyramids in Egypt in my bucket list for a long time, for example. Having said all that, I was acutely aware of the issues of prejudice, bigotry, and discrimination prevalent in Nepal. Nepalis are probably prejudiced against — and discriminate — fellow Nepalis even more than they do most foreigners, if not all. However, I had come to believe that I may no longer be targeted the way — or as much as — I felt and believed I had been when growing up in the country. After all, I had reasoned, I had academic qualifications from educational institutions in the US and Australia. I had studied in two additional Western countries. I had had an extensive international professional experience. I had also traveled extensively and had become someone completely and totally different from not just what my society had said I should or could be as a Bhote but also from what I myself had imagined being. So I decided to accede to the universe ( 😀 ) and decided to turn down the job offer and return to Nepal. In Nepal I will fit in, I won’t be discriminated, I thought, I believed. (Little did I know, the universe had something bigger up its sleeves as it were. Less than three months after I turned down the job offer and less than two month after I made public my decision to return to Nepal, I was victimized in the BIGGEST way! Placing very little value on my life because of my nationality, the father of a student at the school I taught at brought charges of insulting Islam against me, had me fired from my job, and then jailed. Luckily for me a Free Dorje Gurung campaign led to my release on the condition that I fly home immediately!